More often than not, assessments of future climate risks are based on future climatic conditions superimposed on current socioeconomic conditions only. The new IPCC-guided alternative global development trends, the shared socioeconomic pathways (SSPs), have the potential to enhance the integration of future socioeconomic conditions—in the form of socioeconomic scenarios—within assessments of future climate risks. Being global development pathways, the SSPs lack regional and sectoral details. To increase their suitability in sectoral and/or regional studies and their relevance for local stakeholders, the SSPs have to be extended. We propose here a new method to extend the SSPs that makes use of existing scenario studies, the (re)use of which has been underestimated so far. Our approach lies in a systematic matching of multiple scenario sets that facilitates enrichment of the global SSPs with regional and sectoral information, in terms of both storylines and quantitative projections. We apply this method to develop extended SSPs of human vulnerability in Europe and to quantify them for a number of key indicators at the sub-national level up to 2050, based on the co-use of the matched scenarios’ quantitative outputs. Results show that such a method leads to internally consistent extended SSPs with detailed and highly quantified narratives that are tightly linked to global contexts. This method also provides multiple entry points where the relevance of scenarios to local stakeholders can be tested and strengthened. The extended SSPs can be readily employed to explore future populations’ vulnerability to climate hazards under varying levels of socioeconomic development. The online version of this article ( https://doi.org/10.1007/s10584-018-2318-8) contains supplementary material, which is available to authorized users. Being driven by both climatic and socioeconomic determinants, future climate risks depend on both future climatic and socioeconomic conditions (Birkmann et al. 2013). 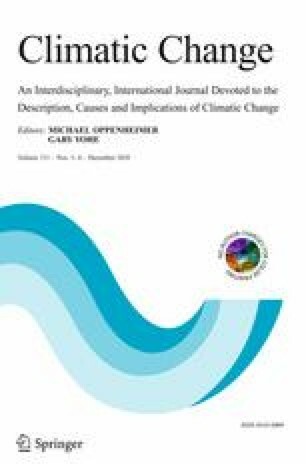 Nevertheless, the overwhelming majority of assessments of future climate risks are based on climate scenarios superimposed on current socioeconomic conditions only, hence neglecting the contribution of socioeconomic development and assuming that drivers of risk other than climate change will remain constant (Ebi et al. 2016; Preston et al. 2011), although some notable exceptions exist (e.g., Carter et al. 2016). To justify such lack of consideration for future socioeconomic conditions, authors traditionally point out the scarcity of relevant socioeconomic scenarios and projections for impacts, adaptation, and vulnerability (IAV) studies. Partly to enhance the integration of socioeconomic scenarios in IAV assessments, the climate change research community has developed a new set of alternative global development trends, namely the shared socioeconomic pathways—SSPs (O’Neill et al. 2014). The SSPs are part of the new scenario framework for climate change research (Moss et al. 2010), which also comprises a set of greenhouse gas concentration trajectories, namely the representative concentration pathways—RCPs (van Vuuren et al. 2011), and a set of global policy assumptions, namely the shared policy assumptions—SPAs (Kriegler et al. 2014). These three elements have been purposely designed to be combined for exploring future climate risks as well as adaptation and mitigation options (van Vuuren et al. 2014). In this paper, we focus only on the SSPs, which provide a global context to guide climate-related regional and sectoral scenario studies and facilitate comparative analyses between different case studies (van Ruijven et al. 2014). Unlike the old SRES scenarios (Special Report on Emission Scenarios—IPCC 2000), which were global exploratory scenarios spanning the scenario space across a two-axe matrix (global/regional and economic/environmental), the SSPs have been explicitly developed with respect to challenges to adaptation and mitigation (Rothman et al. 2014). Describing future socioeconomic development pathways in the absence of climate change or climate policies, the SSPs facilitate the exploration of the influence that varying levels of socioeconomic development may have on future climate risks, under a given trajectory of greenhouse gas emissions (van Vuuren et al. 2014). A rapidly growing number of studies have employed the SSPs to explore the joint influence of climate change and socioeconomic development on future climate risks, such as agricultural-related and hunger risks (e.g., Wiebe et al. 2015), water scarcity risk (e.g., Arnell and Lloyd-Hughes 2014), flood risk (e.g., Alfieri et al. 2016), fire risk (Knorr et al. 2016), risk of vector-borne diseases (Monaghan et al. 2018), and heat stress risk (e.g., Dong et al. 2015; Marsha et al. 2018; Rohat et al. 2018). However, most of these IAV studies made a straightforward use of the global SSPs and relied on quantitative projections at the national level only (IIASA 2016)—or simplistically downscaled at the sub-national level assuming homogenous growth/decline within the country—without accounting for the sectoral and regional context. To enhance their suitability in sectoral and regional IAV studies (Wilbanks and Ebi 2014) and to increase their legitimacy and intake by local stakeholders and practitioners (Absar and Preston 2015), the global SSPs must be extended, i.e., contextualized, detailed, and eventually quantified for a given sector and/or region (van Ruijven et al. 2014). Such integration of regional and sectoral specificities is facilitated by the flexibility of the SSPs, which have been intentionally designed to be extended (O’Neill et al. 2017). Thought to be a critical activity, the extension of the global SSPs is rapidly growing. Examples of extensions include: (i) extended SSPs of population growth and urban development at the global scale (Jones and O’Neill 2016), in large cities (Hoornweg and Pope 2016), and in coastal zones (Merkens et al. 2016; Reimann et al. 2018); (ii) regional SSPs for Europe (Kok et al. 2015), Tokyo (Kamei et al. 2016), the Barents region (Nilsson et al. 2017; Van Oort et al. 2015), and US Southeast (Absar and Preston 2015); (iii) extended SSPs for health (Sellers and Ebi 2017); (iv) extended SSPs of food security worldwide (Hasegawa et al. 2015), in Southeast Asia (Mason-D'Croz et al. 2016) and in West Africa (Palazzo et al. 2017); and (v) extended SSPs of water use worldwide (Wada et al. 2016) and in China (Yao et al. 2017). Across the existing methods to develop the extended SSPs, we identified a number of areas where further enhancements might still be possible. Firstly, most of the IAV studies that use the SSPs only employ the quantitative projections—e.g., population, GDP, education, and urbanization—available at the country level from the SSPs database (IIASA 2016). Although such an approach is often appropriate, it does not address the issue of contextualizing global scenarios to a specific sector and/or region. Secondly, existing extended SSPs that provide extensions of the storylines are often not accompanied with quantitative projections. While qualitative aspects of scenarios are sufficient in a number of cases, the lack of quantification may restrict their usefulness in quantitative IAV assessments. Thus, methods that concurrently provide detailed narratives and quantification of extended SSPs are needed. Thirdly, the extended SSPs’ storylines that have been subsequently quantified are mostly extended SSPs of population growth, for which a limited number of socioeconomic variables have been quantified—usually population growth and urbanization. While these quantitative projections are crucial to explore future patterns of human exposure, quantification of a wider range of socioeconomic and environmental variables is also needed to scrutinize future vulnerability patterns. Fourthly, the existing methods to develop extended SSPs generally do not include any systematic and thorough control to ensure the coherency between the extended SSPs and the global SSPs—although notable exceptions have to be pointed out (Kok et al. 2015; Palazzo et al. 2017). Finally, the development of the extended SSPs can be resource and time intensive, as co-development with stakeholders is important and some scenarios may need to be designed almost from scratch. In light of these areas of potential improvements, and building on a few structured and promising methods to extend the global SSPs (Absar and Preston 2015; Kemp-Benedict et al. 2014; Nilsson et al. 2017; Palazzo et al. 2017), we propose here a new method to develop and readily quantify regional and sectoral extensions of the global SSPs. This method relies exclusively on existing scenario studies, of which the potential usefulness has often been pointed out (Hunt et al. 2012) but the (re)use somewhat underestimated so far. In addition to making use of existing knowledge and to providing a structured and systematic matching of the global SSPs with multiple regional and sectoral scenario sets, the main benefit of this method is that it provides a high degree of quantification through the co-use of existing projections. To exemplify our method, we aim here to develop and quantify extended SSPs of human vulnerability in Europe. Over the past decades, much work has been carried out to identify the wide array of drivers of human vulnerability—i.e., the propensity or predisposition of human populations to be adversely affected by climatic hazards (IPCC 2012)—but very little has been done to explore how they will evolve in the future under varying levels of socioeconomic development (Carter et al. 2016; Dunford et al. 2015; Preston et al. 2011). Applying the method presented in this paper, we develop a set of extended SSPs of human vulnerability for 25 member states of the European Union and quantify them for 259 sub-national regions up to 2050. In the past decades, a very large number of scenario sets have been developed—often in relation to environmental issues—as reviewed by, e.g., Aerts et al. (2013), EEA (2011), IPBES (2016), and Hunt et al. (2012). Even though the quality of these scenario studies may differ (Kok et al. 2015), it has been recognized that it would be unwise not to profit from this knowledge (Hunt et al. 2012; Westhoek et al. 2006). However, methods that (re)use existing scenario sets remain to be explored (Kok et al. 2013). To our knowledge, past scenario exercises have been mainly employed through (i) the use of their narratives as a starting point to create new scenarios’ storylines rather than starting from scratch (Absar and Preston 2015; Kok et al. 2016) and (ii) the comparison of their quantitative outputs to explore discrepancies and trends of existing projections in a given research area, e.g., land use in Europe (Busch 2006). Despite having been developed independently, many scenario sets show great similarities in terms of narratives and thus can be compared and eventually matched. Techniques to match multiple scenario sets include the classification by archetypes and families (Hunt et al. 2012; IPBES 2016; Rohat et al. 2017; van Vuuren and Carter 2014; van Vuuren et al. 2012), plotting against one scenario set of reference (Hunt et al. 2012), and the classification around two axes—usually global/regional and individual/collectivism axes (Busch 2006; Kok et al. 2013). Such approaches allow for classifying different scenarios with regard to their overall orientation and main assumptions, but do not thoroughly investigate manifold assumptions and thus cannot be employed to provide a meticulous scenario matching (van Vuuren and Carter 2014). A few recent studies have conducted a more comprehensive matching of different scenario sets based on a more detailed analysis of their narratives (Kok et al. 2015; Palazzo et al. 2017), but such practice remains surprisingly rare (Kemp-Benedict et al. 2014). Moreover, results from the few studies available have revealed important areas of improvement that have not yet been addressed, stressing the need for a scenario matching method that (i) is flexible enough to consider more than two different scenario sets, (ii) performs the matching in a structured and systematic manner, (iii) curtails the use of normative judgements to compare scenarios, and (iv) provides information on the quality of the matches. Computer-aided and structural scenario–related methods—such as the cross-impact balance analysis (Schweizer and O’Neill 2014)—show a great potential in systematically comparing and matching existing scenarios, but this potential has yet to be demonstrated. Bearing in mind that the use and the combination of elements from different scenario studies has to be carried out with care in order to ensure internal consistency (Hunt et al. 2012), we argue here that methods to combine and match existing scenario sets in a transparent and systematic manner must be developed in order to produce and quantify new scenario sets relevant for sectoral and regional IAV quantitative assessments. We applied the following restricting criteria to select the scenario sets that will be used to inform the global SSPs with relevant information about future human vulnerability in Europe. The scenario sets must (i) focus on Europe, (ii) have been developed recently (i.e., post-2010) to ensure their timeliness (iii) contain at least four different scenarios—in order to increase the likelihood of matching them with the five SSPs—(iv) be related to human vulnerability, (v) contain detailed storylines about future socioeconomic and/or environmental conditions in Europe up to 2050, (vi) be quantified for relevant socioeconomic and/or environmental variables at the sub-national level—at least at the NUTS-2 level (Nomenclature of Territorial Units for Statistics, Eurostat 2016)—up to 2050, (vii) be widely accepted by the scientific community, and (viii) not contain any explicit assumptions about future levels of greenhouse gas emissions. The latter is of utmost importance to ensure that the extended SSPs can be coupled with different RCPs in future IAV assessments. The screening process (Table S1 in Supplement) led to the selection of three different European scenario sets, namely ET2050 scenarios (MCRIT 2014), DEMIFER scenarios (Rees et al. 2010; Rees et al. 2012) and CLIMSAVE scenarios (Gramberger et al. 2013). Despite their differences in terms of development approach (e.g., participatory vs desk research), these are all exploratory scenario sets which aim at supporting strategic planning and decision support (further detailed in Tables S2–S3 in Supplement). In a nutshell, the four ET2050 scenarios focus on territorial development and cohesion and have been quantified at the sub-national scale (NUTS-2 and NUTS-3) for variables such as accessibility, transport nodes, and urbanization. The five DEMIFER scenarios focus on demographic change and its associated drivers, with a strong emphasis on European and national policies, and have been quantified at the sub-national level (NUTS-2) for demographic variables such as migration, life expectancy, population growth, and labor force. 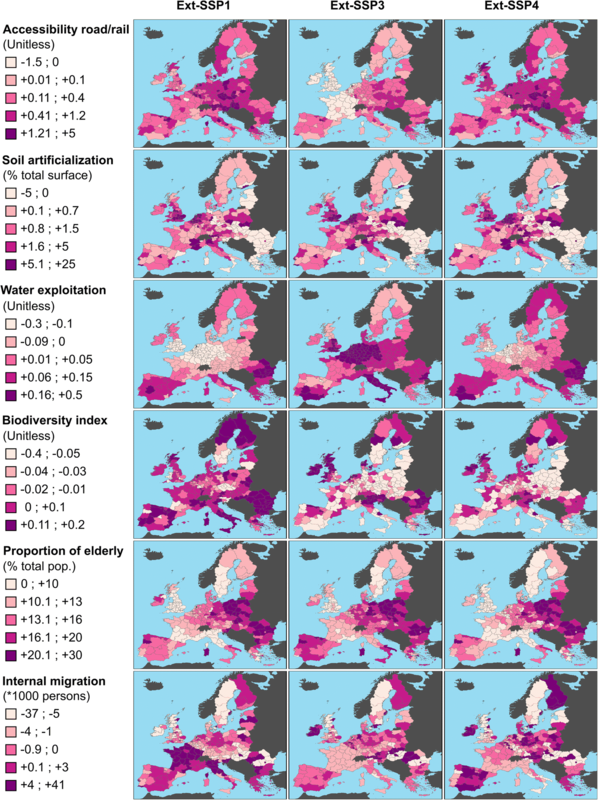 The four CLIMSAVE scenarios are multi-disciplinary and cross sectoral and are the most up-to-date and detailed set of environmental change–related socioeconomic scenarios in Europe, although the next generation is currently being developed (Kok et al. 2016). Their quantification has been mostly focused on ecosystem services and provisions (e.g., food security, water exploitation) and on determinants of environmental conditions. The scenario matching method presented here (synthesized in Fig. 1) comprises five main steps during which an internally consistent scenario set is developed based on the combination of several existing scenario sets. This method relies on a transparent, systematic, and semi-quantitative investigation of the similarities and discrepancies between qualitative assumptions of multiple scenario sets (i.e., more than two). A point worth mentioning is that the different scenario sets do not necessarily have to be produced at the same spatial scale, as multi-scale scenarios can also be compared and checked for coherency and consistency (Zurek and Henrichs 2007). However, the different scenario sets should share a similar time horizon to facilitate their comparison, with the exception of the global SSPs. Being wide socioeconomic development pathways rather than detailed socioeconomic scenarios per se (O’Neill et al. 2017), the SSPs provide future boundaries conditions and depict broad trends that are applicable throughout the entire twenty-first century. Thus, they can be compared with scenario sets of shorter time horizon, as already achieved in, e.g., Kok et al. (2015) and Palazzo et al. (2017). In case of non-linear changes—such as population growth, which often peaks and declines—the use of basic quantification of the global SSPs (IIASA 2016) might be required to better envision the non-linear variations of the variable and its state at a given time. Here, we match the narratives of four relevant scenario sets, namely three European scenario sets and the global SSPs (i.e., 18 scenarios in total). The narratives of the global SSPs were retrieved from O’Neill et al. (2017), whereas narratives of DEMIFER scenarios were retrieved from Rees et al. (2010, 2012), ET2050 scenarios from MCRIT (2014), and CLIMSAVE scenarios from Kok et al. (2013) and Gramberger et al. (2013). While we did not involve European stakeholders in this study, the scenario matching approach presented here provides a number of entry points for stakeholders. The involvement of stakeholders is generally needed to ensure the saliency and credibility of the extended SSPs, particularly if they are to be applied for decision-making. Following the selection of pertinent scenario sets, we identified several domains of interest, which are key fields that encompass the wide array of socioeconomic and environmental variables relevant to a given research topic and that are depicted in at least one scenario set. We identified here seven different domains that altogether cover a wide range of determinants of human vulnerability to climate hazards in Europe. 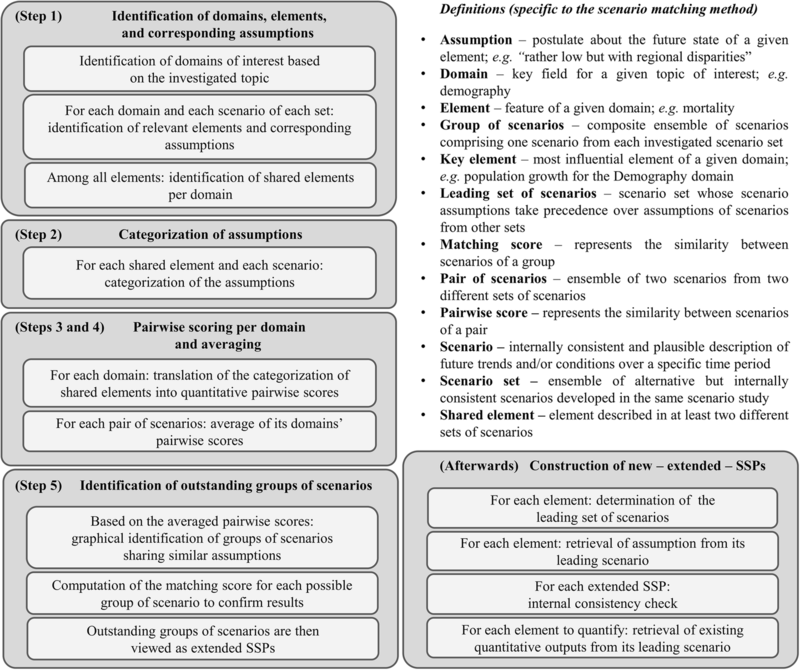 The identification and selection of relevant domains constitute an important entry point for stakeholders, though it is also restricted by what the scenario sets offer. We then conducted a detailed reading of each scenario’s storyline and identified their assumptions for the main elements that are covered by the seven domains of interest. Altogether, we collected assumptions for 46 different elements (Table 1), among which half are shared by at least two scenario sets, while the other half are specified in only one scenario set. For each domain separately, we classified the assumptions of the shared elements into different categories (between 3 and 5) which depict the trend direction and/or the intensity. We assumed a given trend direction/intensity (e.g., “low decrease”) to be similar across the different scenario sets. For a few shared elements (e.g., policy orientation), the categories were based on the orientation of the assumptions (e.g., “towards internal issues”). As an example, Fig. 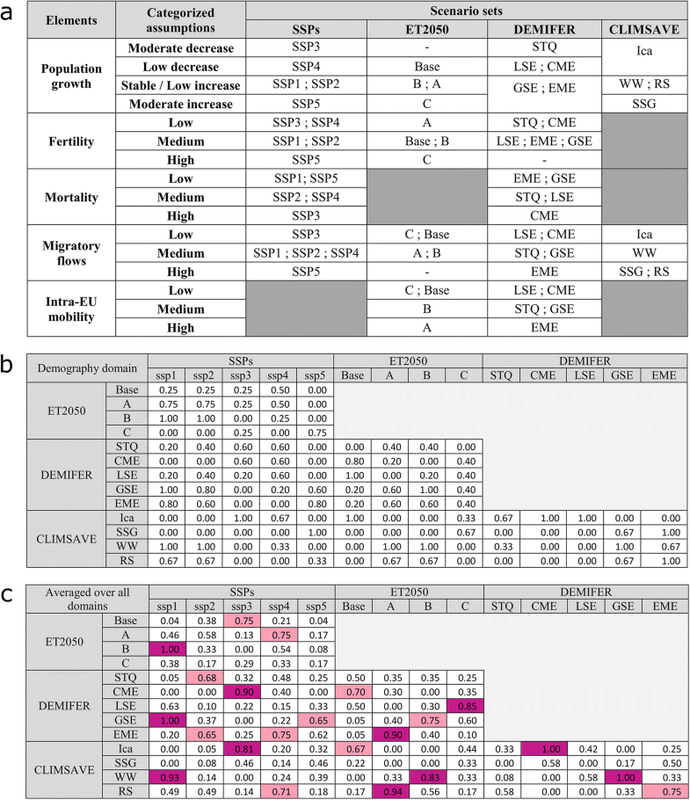 2a displays the categorization of the Demography domain’s shared elements (see Table S4 in Supplement for the other domains). The translation of the narratives’ assumptions into categories (i.e., the conversion of one or several statements into a single trend direction and/or intensity) inevitably required subjective interpretation, particularly when the baseline state was not clearly specified or when the trends were not distinctly differentiated between two scenarios of the same set. We attempted to reduce such subjective judgment to a minimum by allowing flexibility in the categorization. By so doing, assumptions of two different scenarios of a same set could be placed in the same category and one scenario’s assumption could be placed in two different categories. For each domain separately, we performed a pairwise scoring for all the 121 possible pairs of scenarios, based on the categorization of assumptions carried out in Step 2. 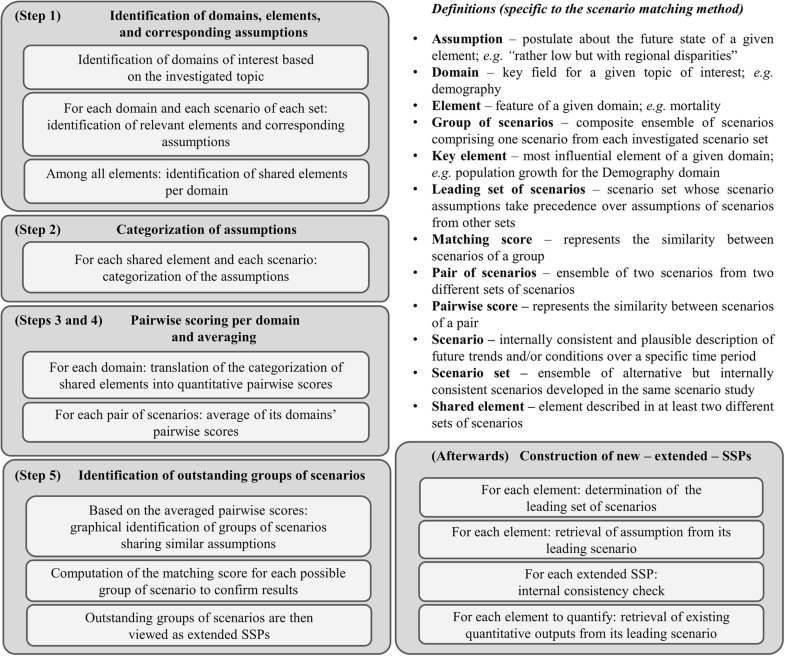 The pairwise score for each domain was computed as the ratio between the number of common assumptions and the number of shared elements (which varied from 2 to 5 depending on the domain). We also defined one key element per domain, which are the most important and/or influential elements of a given domain, and which were weighted double that of the other elements. The identification of key elements and the definition of their degree of importance compared to other elements (i.e., their weight) constitutes another important entry point for stakeholders, whose expertise and local knowledge are useful resources to make such normative choices. 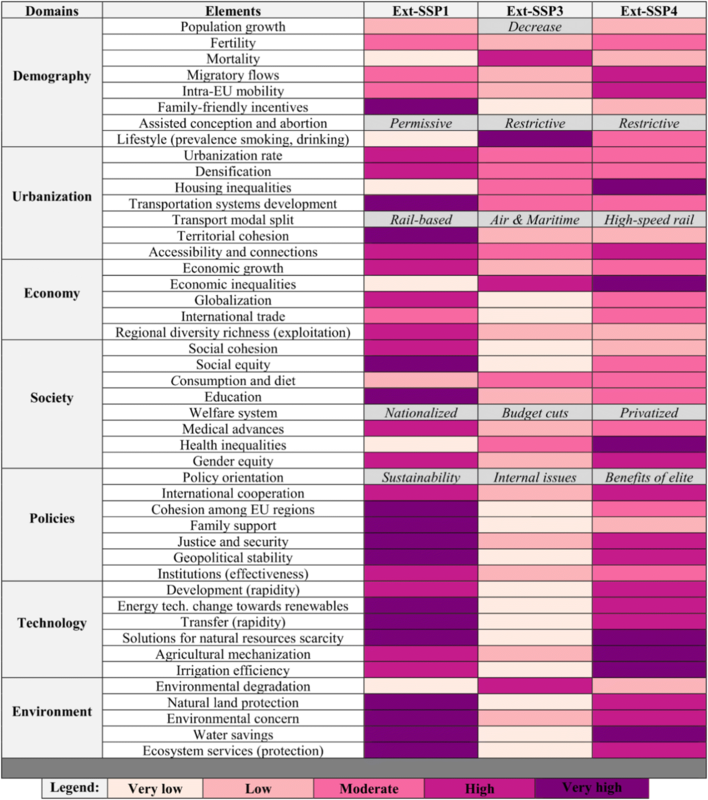 Here, we employed existing literature and a straightforward process (see Appendix S1 in Supplement) to identify each domain’s key element, namely population growth (Demography domain), urbanization rate (Urbanization), economic growth (Economy), social cohesion (Society), policy orientation (Policies), technology development (Technology), and environmental degradation (Environment). Results of the pairwise scoring per domain are displayed in Fig. 2b for the Demography domain and in Table S5 in Supplement for the other domains. For each of the 121 pairs of scenarios, we then averaged the domain’s pairwise scores into a single pairwise score (Fig. 2c). We classified the resulting averaged pairwise scores into four categories of match—namely very good, good, poor, and no match—based on thresholds (> 0.80, > 0.65, > 0, and = 0 for very good, good, poor, and no match respectively). This way, two scenarios sharing a high number of similar assumptions for the shared elements of all the investigated domains were considered as a good or very good match. Out of the 121 pairs of scenarios, 11 were classified as very good match, 11 as good match, 79 as poor match, and 20 as no match. Based on the averaged pairwise scores, we graphically linked the pairs of scenarios that showed good or very good matches (Fig. 3). As a result, three groups of scenarios sharing significantly similar narratives were identified—one group of scenarios being defined as the combination of one scenario from each of the four scenario sets. These three standout groups of scenarios were therefore viewed as sectoral and regional extension of the global SSP contained in each group. As an example, the extended version of SSP1—named hereafter Ext-SSP1—is made of the combination of SSP1, ET2050-B scenario, DEMIFER-GSE scenario, and CLIMSAVE-WW scenario. To explore the robustness of this approach, we (i) employed different thresholds to define good/very good match in Step 4 (see Fig. S1 in Supplement) and (ii) computed a matching score for each possible group of scenarios, i.e., the 400 possible combinations linking the scenarios across the four scenario sets (5 SSPs * 4 ET2050 scenarios * 5 DEMIFER scenarios * 4 CLIMSAVE scenarios). The matching score of each group of scenarios was obtained by summing the averaged pairwise score of each pair composing the group of scenario (i.e., 6 pairs per group). Among the 400 possible groups of scenarios, the three Ext-SSPs obtained the highest scores (see Fig. S2 in Supplement). Being made of the combination of four different scenarios, the narratives of the Ext-SSPs had to be clarified for the 46 elements investigated. To do so, we defined one leading scenario set—as introduced by Kok et al. (2016)—for each element, based on the thematic focus of each scenario set and on the comprehensiveness of their narratives in a given domain (further detailed in Appendix S2 in Supplement). The selection of leading scenario sets for each element constitutes another entry point for stakeholders. The assumptions of the scenario of the leading set take precedence over the assumptions of other scenarios. In this way, for a given element, the assumption of a given Ext-SSP is similar to the one of the scenario of the leading set. We employed this process to establish detailed storylines for the 46 investigated elements of each Ext-SSP (Table 2). Employing the assumptions of different scenarios to create one unique extended storyline increases the risk of internal inconsistency in the narratives (Hunt et al. 2012). Bearing this in mind, we performed a thorough internal consistency check of each Ext-SSP to (i) ensure that assumptions of shared elements for one scenario were consistent with assumptions of non-shared elements described in another scenario—namely vertical consistency—and to (ii) point out disagreements between scenarios’ assumptions for shared elements within the same group—namely horizontal consistency (further detailed in Appendix S3 in Supplement). The horizontal consistency check was achieved through the classification of the shared elements’ assumptions (for each scenario within a given group) into equivalent, coherent, or disparate, compared to the assumptions of the scenario of the leading set. Disparate assumptions were regarded as a threat to internal consistency. The vertical consistency check was performed by means of logical reasoning, making use of the results of the horizontal consistency check, and assuming that previously developed scenarios were internally consistent. This way, the combination of the internal consistency of existing scenarios with the horizontal consistency of the newly created Ext-SSPs led to vertical consistency (further detailed in Appendix S4 in Supplement). To quantify the Ext-SSPs, we entirely relied on the co-use of existing quantitative projections retrieved from the European scenario sets that we used to extend the SSPs. In fact, we argue here that a systematic scenario matching followed by such a thorough internal consistency check allows for co-using the quantitative projections coming from different scenario studies. Therefore, we combined the scenario sets not only in their qualitative aspect (i.e., narratives), but also in their quantitative form (i.e., quantitative projections). Based on the matching of scenarios originating from different existing sets, we developed regional and sectoral extensions of three different global SSPs, namely Ext-SSP1, Ext-SSP3, and Ext-SSP4. No good matches were established for SSP2 and SSP5; we were therefore unable to extend them. The different European scenario sets that were employed to create the Ext-SSPs all informed the regional extension of the SSPs at both the European and sub-national (NUTS-2) levels. Their contribution to the sectoral extension differed, however. DEMIFER scenarios provided much of the sectoral extension on demographic and social trends, ET2050 scenarios mainly contributed to the extension on urban and territorial development, and CLIMSAVE scenarios provided extension on environmental conditions as well as on European policies and technology to some extent. 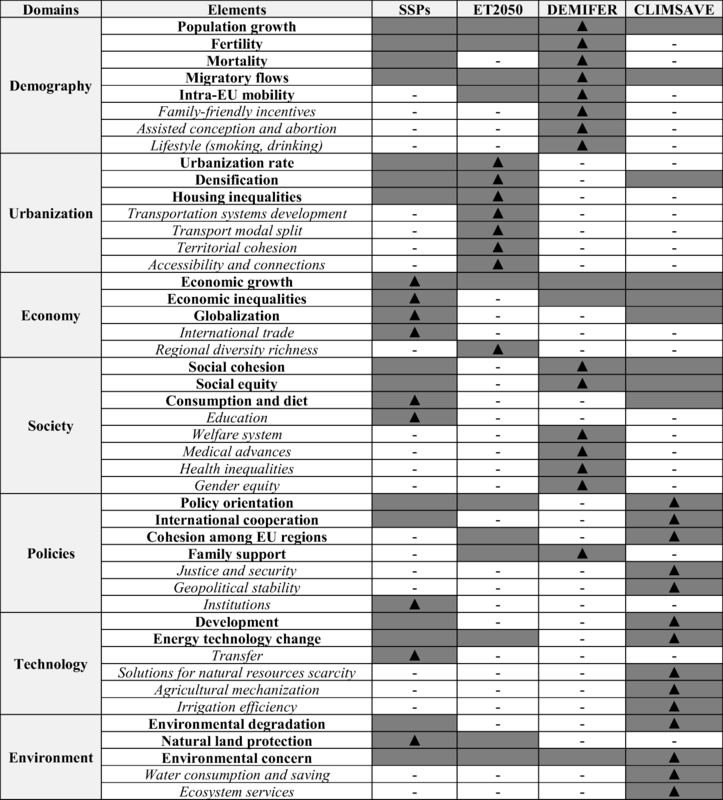 Through the determination of leading scenario sets for the 46 elements identified, we developed detailed narratives for each Ext-SSP (Table 2 and Table S6 in Supplement), describing contrasting future states of Europe in 2050, with particular emphasis on expected changes in domains relevant to human vulnerability. Results of the internal consistency check (Appendix S5 in Supplement) showed that the three Ext-SSPs are internally consistent, with Ext-SSP1 and Ext-SSP3 showing the highest horizontal consistency (respectively 36 (30) assumptions equivalent, 2 (8) coherent, and none disparate). Ext-SSP4 showed the lowest horizontal consistency, with 30 assumptions equivalent, 7 coherent, and 1 disparate. The vertical consistency check corroborated the internal consistency of Ext-SSP1 and Ext-SSP3 and ensured that the disparate assumption of Ext-SSP4 (for the element “population growth”) did not threaten its internal consistency. Based on the co-use of the matched scenarios’ quantitative outputs, we quantified the three Ext-SSPs for a wide range of socioeconomic and environmental variables, such as (i) population growth, mortality, life expectancy, migratory flows, and labor force participation—all quantified within the DEMIFER project—(ii) accessibility per travel mode (rail, air, road, maritime), urbanization, and land use—produced within the ET2050 project—and (iii) fertilizer/pesticide usage, water withdrawals, biodiversity index, and many more ecosystems-related variables—all projected within the CLIMSAVE project. All of these projections are available at the sub-national level (NUTS-2) for 259 sub-national regions, up to 2050, with a common baseline year (2010). Relying on such a high level of quantification, we directly retrieved these readily available projections from their respective research projects for a number of variables related to human vulnerability and explored their future trends under the three Ext-SSPs (Fig. 4 and Fig. S3 in Supplement). We particularly focused on changes—compared to baseline (2010)—in accessibility to road/rail and soil artificialization (retrieved from ET2050 project), water exploitation and biodiversity index (retrieved from CLIMSAVE project), and proportion of elderly and internal migration (retrieved from DEMIFER project). In line with the Ext-SSPs’ narratives, results showed that the three socioeconomic development pathways have a highly contrasting influence on a number of environmental and socioeconomic variables. Under all scenarios, large spatial disparities can be seen both across and within countries, highlighting the need for a sub-national quantification of the Ext-SSPs for regional IAV studies. The regional and sectoral contextualization and quantification of global development trends such as the SSPs is an inevitable step to enhance their relevance in regional and sectoral IAV studies and their intake by local stakeholders (van Ruijven et al. 2014). With a focus on future human vulnerability in Europe, we presented in this paper a method that uses existing scenario studies to extend the global SSPs. Building upon existing methods to develop extended SSPs, such an approach demonstrates a number of benefits. Firstly, it enables the matching of multiple sets of local existing scenarios with the global SSPs, whereas so far existing methods facilitate matching of only one set of local scenarios with the SSPs (e.g., Nilsson et al. 2017). Such a matching of multiple scenario sets permits a richer and wider extension of the global SSPs than methods based on a single-scenario set. Through the matching of three sets of European scenarios with the global SSPs, we developed Ext-SSPs that possess very detailed narratives in multiple sectors such as future environmental conditions (informed by the CLIMSAVE scenarios), demographic trends (informed by the DEMIFER scenarios), and territorial development (informed by the ET2050 scenarios). However, because such an approach requires the use of several existing scenario sets, its applicability may be challenged by the lack of appropriate scenarios. This is particularly the case in scenario-poor environments (e.g., at the local scale or for time-horizons beyond 2050), in which it might be challenging to find scenario sets that (i) are of high quality, (ii) are associated with quantitative projections that share a common baseline, and (iii) respect certain criteria to be mapped against SSPs—such as having at least four different scenarios and not containing any explicit information about future levels of greenhouse gas emissions. Secondly, through the co-use of existing quantitative projections from the leading scenario sets, this method allows for the ready quantification of Ext-SSPs for manifold socioeconomic and environmental variables. As an example, we quantified the three Ext-SSPs for a number of drivers of human vulnerability in Europe, up to 2050, at a relevant sub-national spatial scale. Such a high level of quantification—in addition to the detailed storylines that are relevant to stakeholders—constitutes the greatest benefit of this method to extend the SSPs. This particularly holds since the scarcity of quantitative projections consistent with locally relevant socioeconomic scenarios is one of the main factors limiting their use in IAV studies (Rohat 2018). Despite the fact that a number of IAV studies based on the SSPs only employed a selection of them (e.g., Marsha et al. (2018) and Monaghan et al. (2018) who considered only SSP3 and SSP5 or Knorr et al. 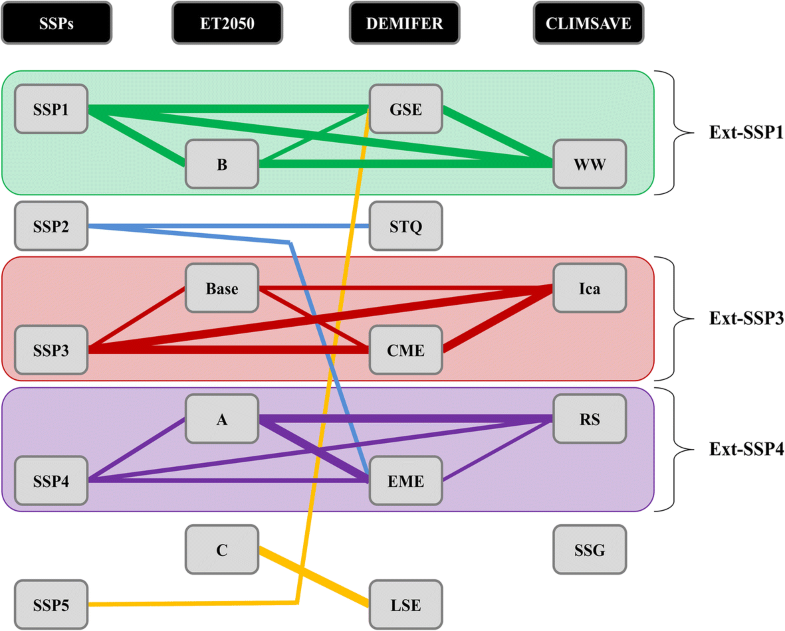 (2016) who considered SSP2, SSP3, and SSP5), the inability of the method presented here to extend all the five SSPs for a particular sector/region may limit its potential usefulness among the IAV community. This is particularly true in view of the growing number of environmental research projects that make use of at least four different SSPs, e.g., “Adaptation Actions for a Changing Arctic” (Nilsson et al. 2017), “Impacts and Risk from High-End Scenarios” (Kok et al. 2016), and “Towards Sustainable and Resilient European Farming Systems” (Mathijs et al. 2018). Although SSP2 and SSP5 have been previously linked to other global scenarios—based on archetypes (van Vuuren et al. 2012), we were not able to extend them, partly because the method that we developed provides a far more detailed analysis of the (dis)similarities between scenarios’ assumptions than a mapping by archetypes. This is crucial to ensure the Ext-SSPs’ internal consistency and to enable the co-use of the matched scenarios’ quantitative outputs. Moreover, the peculiar structure of the set of SSPs also limits the matching of SSPs with existing scenario sets, which usually comprise four contrasted scenarios based on a more conventional two-axe structure. This particularly affects the potential matching of SSP2, being a business-as-usual (“middle of the road”) scenario. As for SSP5, we found that its poor match with other existing scenarios—also highlighted in Kok et al. (2018)—mainly lies in the dichotomy between its assumption of high societal sustainability driven by a strong economic growth (dominated by fossil fuels energy) and its assumptions of low environmental sustainability and of low concern for the natural capital. In the other investigated scenario sets, we found that scenarios depicting low environmental sustainability were often associated with very low economic growth and low social capital (e.g., CLIMSAVE SSG), whereas most scenarios depicting high societal sustainability also assumed a high environmental sustainability and a divergence from fossil fuels (i.e., closer to the SSP1 storyline). An interesting follow-up research exercise would be to include the European SSPs (Kok et al. 2016; Kok et al. 2018) within the scenario matching analysis and to explore in particular the discrepancies and similarities between the European SSP5 and existing local European scenarios. Thirdly, through the categorization of scenarios’ assumptions and the computation of pairwise and matching scores, this method provides a structured and systematic assessment of the similarities between different scenarios of multiple scenario sets. This guarantees the quality of the matches, the coherency between the extended SSPs and the global SSPs, and the internal consistency of the extended SSPs. However, although being structured and semi-quantitative, this method still requires a number of normative judgments, which might alter the outcomes of the scenario matching. For instance, these include the selection of relevant domains and elements, the weighting of key elements, and the selection of a leading scenario set for each element. We emphasize here the need to fall back on stakeholders for making these normative judgments, as their expertise and local knowledge are useful resources. Moreover, the categorization of the assumptions in step 2 inevitably required subjective interpretation. The use of qualitative data analysis tools (Stratigea et al. 2012) to reduce such subjective interpretation would be worth exploring. In the same vein, the use of computer-aided and structural scenario–related methods—e.g., cross-impact balance analysis (Schweizer and O’Neill 2014; Schweizer and Kurniawan 2016)—would also be worth investigating. While these methods have been designed to explore scenario spaces in a systematic manner (Carlsen et al. 2016a) and to select relevant scenarios among a computer-generated large ensemble of plausible futures (e.g., Carlsen et al. 2016b; Lamontagne et al. 2018), these could be derived from their initial usage and be applied within the scenario matching approach to classify the scenarios’ elements and their assumptions and to perform a systematic consistency check of all the potential Ext-SSPs (i.e., all groups of scenarios). Finally, this approach is less resource and time-consuming than existing methods to extend SSPs that necessitate to involve (i) stakeholders in form of participatory workshops (e.g., Nilsson et al. 2017) and (ii) modeling teams to translate the narratives into quantitative projections (e.g., Palazzo et al. 2017). However, such shortcuts and gain of time and resources may threaten the stakeholders’ ownership of scenarios, who are involved in the scenarios’ development only through specific entry points. To ensure the credibility of the final scenario sets, particular attention should be given to the initial acceptance by stakeholders of the composite scenario sets employed to extend the SSPs. In view of the detailed narratives and of the high degree of quantification it provides, combined with its high cost efficiency and the reliability of the matching it provides, such an approach shows great potential to be taken on board by the IAV community to develop and readily quantify regional and sectoral extended SSPs. The latter contain crucial additional information—both qualitative and quantitative—to explore the influence of varying levels of regional socioeconomic development—linked to global contexts—on future vulnerability to climate hazards. Ultimately, these extended SSPs should be integrated within a scenario matrix architecture together with RCPs depicting different levels of greenhouse gas emissions and shared policy assumptions (SPAs) depicting various climate mitigation and adaptation policies. Such scenario matrix architecture can be used to assess the joint contribution of climate and regional socioeconomic changes to future climate risks and to explore the differential impacts of a given RCP under varying levels of socioeconomic development and different adaptation policies. However further research is needed to explore ways to implement the SPAs in IAV-related scenario studies and ways to differentiate autonomous adaptation within the regional SSPs from specific adaptation options and strategies defined by the climate policies. We wish to thank Prof. Dr. Michael Wegener, Dr. Hedwig van Delden, and Marjan van Herwijnen for providing data related to the ET2050 project. We also want to acknowledge Dr. George Cojocaru for his support in using the CLIMSAVE IAP as well as Dr. Andries de Jong for her valuable insights on the DEMIFER data. We finally thank the two anonymous reviewers for their thoughtful comments that helped improve the paper. This work was partly supported by the State Secretariat for Education, Research, and Innovation (SERI, Switzerland) within the framework of its program “Cotutelles de these”.